Posted on October 1, 2015, in Poetry and tagged DoubleU, John White, Mr. President, Poetry. Bookmark the permalink. 67 Comments. I don’t know that I would have stated exactly the same way you did, but we share the same conclusion. The spokesperson for the school made a powerful statement: that the last bus was headed for the fairgrounds. 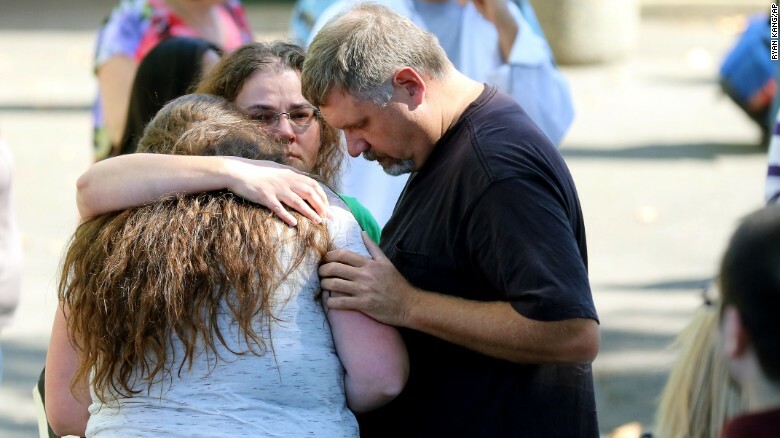 Grief counselors would be present for the families who didn’t have children getting off that bus. There are empty places at some Oregon tables tonight. I can’t imagine the grief I would feel if one of mine were counted among the dead. Thank you, Scott! It’s simply madness having to count the body bags so often and we need to all do some real work to figure out how to end it. Why does this happen only in America? Even after numerous incidents, why has it not been controlled? Heart goes out to all the innocent souls who fell victim of such a ghastly act! RIP.. Thank you, Hasmeet! Our nation has been rather gun-obsessed for a very long time. Guns are collected and cherished in a way here unlike any other country on earth. It’s hard to explain even to some Americans like me. But you’re asking a fundamental question worthy of a good answer. I keep asking why can’t we value life more than we do guns? Good question. This is what development does! Sad! You’re right. People have an odd way of blocking things out like this and moving on without thinking about the victims. If life can’t be valued, what kind of future do we have? In America it will be a frightening day when only sociopathic cops have guns. The government wants the public to be seen as crazy. I don’t own a gun and wish there was no such thing but this is all a part of the grand scheme of things to come. I believe guns will be outlawed one day in America, then watch all hell break loose. This is just the beginning. Thank you, Dara! I’m not sure we could outlaw guns without some major upheaval. Japan has had tremendous success by doing nearly that very thing, however. They are a great example of what can be done but our culture simply won’t allow it. Level heads need to come together and find solutions or people will keep dying. Mʏ ɦɛaʀt ɢօɛs օʊt tօ tɦɛ ʄaʍɨʟɨɛs tɦat aʀɛ ɢʀɨɛʋɨռɢ! It’s ɨռċօʍքʀɛɦɛռsɨɮʟɛ tօ ʍɛ tɦat tɦɛsɛ sɦօօtɨռɢs ċօռtɨռʊɛ tօ օċċʊʀ. Hɛʟք ʊs aʟʟ! Thank you, Ms. Vee! Those grieving tonight will never see those they lost again and that’s truly sad. We must make some serious changes or this another incident just like this one is inevitable. I aɢʀɛɛ. It sɛɛʍs sօ ċօʍքʟɨċatɛɖ tօ ʍaҡɛ ċɦaռɢɛs tօ ʟaաs, քօʟɨtɨċɨaռs ռɛɛɖ tօ ʍaҡɛ աɛaքօռ ċɦaռɢɛs ɨʍʍɛɖɨatɛʟʏ. Sօ saɖ. If they will show some courage things can be done but I fear the average politician is too interested in getting reelected. That is truly sad. Is it wrong that I’ve been living in a bubble the last few weeks? I just can’t watch /listen to these things anymore. Would it be as rampant if they stopped giving these events press time? The news needs to stop giving these murders the fame they seek going out in a blaze of glory. Thank you! I agree that we sensationalize these events but they are worthy of coverage. My problem with it is and probably will continue to be the publicity the shooter always receives. After every event just like this one the entire nation can name the perpetrator but can hardly name one victim and that’s truly sad. Great poem. I feel your anger and wariness. I share both these emotions with you from Australia. Thank you, Vince. Your country should have taught us all a lesson with the steps taken there in the aftermath of Port Arthur. Unfortunately, the will doesn’t exist here to undertake such action. John it is strongly tied also to NRA lobby group and $$. That is the saddest part for me. You’re right. They have any number of politicians in their hip pockets and the results are staggering. I’m a Brit and these shooting are always so shocking to us in Europe. Apart from the loss of life, what is desperately sad is that the laws don’t change – that actually, these events aren’t shocking anymore. We don’t have, or need guns to protect ourselves or our families, it’s such a strange notion. I feel for Obama, the powerless President, I feel for you all. The Sandy Hook shootings were particularly heartbreaking, but when nothing changed after the mass murder of tiny children, the general feeling here was that nothing would ever change with the gun laws. The world is a sad, fucked up place. Thank you! You’re right. If Sandy Hook can’t change minds about the desperate need for change then nothing will. Sad but true. It’s a pleasure to meet you! Will anything ever change? Possibly not. No matter what good intentions someone originally had once they are sucked into the political system … compromise becomes the order of the day… and values often become lost. (In UK, Corbyn (Labour leader) has his principles but I’m sure compromise will soon alter that). I suspect also that no matter what laws are introduced, there would always be someone crazy enough to break them. You can make weapons illegal but it is harder to stop the illegal trade of them. It is sad that innocent people die too soon. It is wrong to focus on the perpetrator. How long before an originally horrific incident sensationalised by the media turns into a money spinning book, film, etc. Sometimes infamous criminals can turn into famous/celebrities whilst serving time inside prisons. What life lesson is that teaching us? Thank you! I agree completely. Politicians don’t want to stick their necks out for fear of not being reelected while citizens as a whole love guns. It’s a dangerous and lethal combination. Americans must decide, and the sooner the better, that life is more precious than blowing things up and shooting things up. If this guy or the types like him keep staying in power slowly but surely you will see the decline of what used to be the U.S.A. Not only gun control but what once was a superpower is turning into just another country in some remote place of Europe. Saw the speech by the Isreali Prime minister yesterday at the U.N? That was powerful and that guy is a true leader wich has his priorities straight for his own country. I could get into specifics but this would turn into a thesis paper. But a powerful speech, he basically trashed the whole U.N body when started naming situations when Israel has been attacked by rockets, obviously he spoke of the holocaust, the Iran deal ( a joke if it wasn´t so dangerous) and he ende up by saying after all the tragedies the Jewish state has been plagued, since it´s birth, he ended up saying something to the effect “and not a single representative of this body has stand by Israel and spoke out for them, there was just silence” The man stands there, staring at all the U.N representatives and silence, utter silence for 45 seconds he stood there staring at this useless body of representatives. Thank you, Charly! It would be dishonest of me to say that I would align politically with Netanyahu or with anyone who sees war as any one of the first 5 options. However, Obama often wants to deal too intellectually and carefully when there are times that the President of the United States needs to treat a problem like their predecessor Teddy Roosevelt – walk softly and carry a big stick. A problem of this magnitude can’t be solved by tip toeing around it or treating it with kid gloves. Americans love guns and they simply won’t give them up. But compromises for the sake of safety have to be found while we also tackle mental illness like the disease it is. I completely agree with you abou takling the mental disease aspect.Americans do love their guns, completely different than in my country but that is what the people or most of the people want in certain States so who is am I and less the president of the U.S since he does work for the people I don´t. But in my humble opinion being more aware of mental disease and for people to have easier less expensive or even free access to it, it is worth giving it a try. About Netnyahu, if I was living sorrounded my 5 countries that want to destroy me, and they are not to keen in diplomacy to say the least, if I lived there and my country has 7 million people only 7-8 million of Jews compared to hundreds of millions arabs that would gladly destroy them, I would feel safer if I had a commander in chief that war is in his first 5 options. And I don´t say it as a spectator, I was in the army and been there, so I do understand fully welll the consequences of it. And because of his hard stance and not showing weakness quite the contrary a combative style, that in itself is a deterrent for things to escalate to a full blown war. I think we need to treat mental illness as a disease as we diagnose it and treat it with as much compassion as we would any other. That would certainly help. Walking softly and carrying a big stick – or at least the threat of using it – can be a deterrent but to actually go to war, I think, should be a last resort. Human life is far too precious to waste on the battlefield. At some point in our future every single person in this country will know someone, or be someone, directly affected by gun violence. Thank you! Sad but true. It’s come to a point where being out in public causes us to keep our eyes open and heads on a swivel looking for any potential threat. Living in fear is not living. Dang! You did it again! You continue to pull emotions out of people with your words that are so striking. People don’t get it. One day they will. Wow! Powerful. I’m sharing everywhere. Thank you, Tikeetha! This was something written out of pure anger and frustration – emotions that I know so many of us are feeling after this shooting. Let’s hope one day soon we can find a way to prevent this from happening again. I pray that we do. I just can’t take the senseless gun violence anymore. I second that emotion completely! Very passionate opinion and I respect that. I think the problem is far deeper than just guns control. One aspect that the president talked about last time this happened (so sad that I even had to write such line) is a common denominator behind these violent attacks and that is the mental illness issues that many of this assailant had at the time of the shooting. Yet nothing has been done on this front. Mental illness has been so vilify and stigmatize that people are afraid of even talking about it much less reporting it. I think having a national conversation about mental illness is just a small step in the right direction but not enough. The medical community need to re-think how to address individuals with mental issues that might commit such crimes, while protecting civil liberties. Thank you! I agree that mental illness is a disease we need to treat as seriously as any other and likely even more seriously since it can lead to events just like this one. We can’t treat the problem as if it doesn’t exist and we can’t give it a half hearted effort. We need to be all-in on diagnosing and treating mental illness. step one. get rid of the guns. step two: get rid of the guns. step three: get rid of the guns. great poem by the way. Thank you! I can’t say I disagree with you. It’s great to meet you! Thank you, Kerren! Let’s hope that level head prevail and that we can find the change necessary to bring an end to this type of violence. Well done. It’s unfortunate that this is even a discussion. Thank you! Yes, it is unfortunate and action must come and soon. It’s great to meet you! It is to meet you, as well. Thank you, Aquileana! Let’s hope and we can find a way to prevent anything this terrible from happening again. Well said, John. No simple answers, neither for such anger by an individual as by national armies. I’m in the midst of reading a biography of Lawrence Ferlinghetti and the times of the sixties protests and government brutality. Poets were major voices and spoke at huge gatherings. I was there, and here the voices of poets are again called upon to speak truth. Things might not change much but we say what the heart can meditate upon. Thank you! 🙂 I agree that more of us, more Americans in general, have to speak up. Action must be taken. Even if we don’t attempt radical changes we need to try something to prevent these shootings from occurring again. Let’s hope we as a nation wise up soon. It’s great to meet you! Do you allow disagree? A contrary point of view? The first thing a government that is afraid of it’s people does is to ban personal weapons. The second thing it does is let the military control the ordinary people in the streets. None of these shootings would have involved nearly as many deaths if the victims had been armed. ONE victim with a fighting chance to respond is all it takes. Guns are out there. Everyone knows about them. They will not disappear from the face of the earth just because they are banned. Drugs are outlawed and we all know how well that has worked. Alcohol was outlawed for a time in the US and we all saw how well that worked. If you can not TOTALLY remove guns from the streets – and you never can – why are you trying to make the honest, law-abiding people vulnerable to the criminals and mentally insane? Do you know what the police response time is for your area? Do you know how long it takes for a criminal to get through your door if he wants to? How do you take your familie’s safety seriously when you are not prepared to defend them until help arrives. Sometimes all it takes is just knowing you have a gun and are willing to shoot it. That alone will frighten most criminals away. They will move on to an easier target, one who has no gun and no way to fight back. THINK about what you are promoting here. THINK of what will happen to innocent families in the half hour or more between the time you call 911 and the time law enforcement arrives. If that had been someone with a gun…I shudder to think where we would both be now. Thank you! 🙂 There’s always room for a dissenting view. I’m not in favor of removing all guns from society – though no guns could mean a safer society. I am in favor of background checks that go much deeper into a person’s history and psychological well being than our current system does. Again, I’m not advocating outlawing guns, rather a much more common sense approach the registration of guns. It’s great to meet you! Sorry for the long, wordy comment, I tend to get started and ramble on. I’m relieved to read that you’re not aganst guns, and I agree that it would be nice to get them out of the hands of the criminals, mentally incompetent and seriously deranged. My concern with that is the likelyhood that ‘incompetency’ will be used as an excuse to disallow gun ownership to those who vocalize their disagreement with the party in power. I’m not speaking of threats, but of simple disagreement on policy in a public setting. I’m also not speaking of known felons, those under psychiatric treatment, or others who are legitimately dangerous to the average citizen. However, all concerns regarding restrictions for those who don’t follow the law are moot points. The very fact that someone is a criminal or socially out of kilter means that they have no compunction for following the law and it’s quite easy to find someone who will sell firearms under the radar. Unless you have the manpower to assign 24 hour surveillance, the only ones such a law would restrict would be law abiding citizens. You bring up some good and valid points. Just in a few comments, we’ve underlined the dire need for constructive discussion of this issue. There are and will be no easy answers but we as a society must find a way to prevent these mass killings. Step one will be to learn how to compromise. Before compromise must come grass roots understanding of how the world works and how humans think. I believe the only fair way for everyone is that either NO ONE should have a gun or EVERYONE should have a gun. Either option puts everyone on the same playing field. If it was known and demonstrated that everyone had the capability of self defense, much of the crime would stop within a week. People would begin to be nicer to each other because anger could kill.They would learn to control themselves and use words rather than fists or knives, baseball bats….or guns. It wouldn’t stop death by gunfire completely any more than banning guns would, but it would give pause for thought before shooting and that alone would reduce the number of incidences. Probably it would also cut down significantly on violence of other kinds. It has been a pleasure communicating with you. It’s nice to meet someone who is open minded and allows debate on a post like this. I enjoy and welcome debate in my life and since this post touched on such a hot topic for debate I felt that discussion here should be allowed. I would be afraid of everyone being armed since people tend to lose control when they are extremely angry and they may do something they regret. But I’m also not sure that we can or even should disarm everyone. On the topic of mental health, there is a lot of room for improvement especially when it comes to seeing it as a disease rather than a character flaw. I know what you mean, and I’m glad you feel that way. This has been one of the most pleasant ‘debates’ about gun control issues that I have had in a long time. As for everyone having guns and the angry losing control, it would only happen once. After a few incidences people would learn to control their anger. Those who allow their anger to control them are always a danger in society. At the least they make everyone around them uncomfortable to miserable, depending on the degree to which they allow their anger to take them. At the worst the find a way to beat, stab or shoot others to death. They have the right to be angry. They do not have the right to harm others as a result of their own anger, no matter what method of harm falls most readily to hand. I certainly do not want to be at their mercy and I don’t know of anyone who does. A society in which anger is allowed to rule the populace is chaos. In a community where all have the means to defend themselves, those with anger issues will learn control or not. Either way they will not long be a problem. I know it sounds harsh, but we live in a society where the perpetrator is no longer responsible for what he/she does. What good does it do the family of a murdered father for the murder to spend time in jail? Why is that family being punished for simply being in the wrong place at the wrong time? Why not put that murderer to work and send the money to feed the family and send the kids to college? To provide for that family as the father would have? Why should that family struggle to find money for clothes and food while the murderer is being housed, fed, clothed, and provided with free medical care while attending Criminal University in some prison only to get out in a few years more hardened and with more ways to harm? How is that considered restitution? At best, petty criminals get jobs because they don’t want to chance getting shot. At worst, a criminal is shot and killed by an honest citizen while he tries to rob their home. And in that ‘worst case, there is no drag on public the resources to house, clothe, feed and medicate a non-productive and damagnig member of the community. Instead, those funds could be passed on to the real victims of crime. Sorry, here I go again. There are so many pieces to this puzzle that it may take us years to put them all together in order to create a safer society.